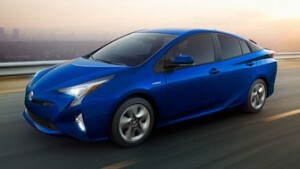 The launch of the latest-generation of Toyota’s world-conquering hybrid, the Prius, is an event of tremendous gravity. Pushing the envelope that was created when the original Prius launched, many years and millions of copies ago, the all-new Prius is gearing up for launch later this year, and it’s smarter, sleeker, more efficient and more compromise-free than any hybrid car before it. The new Prius rides a new Global Architecture, designed and tested around the globe to meet challenging demands in countless markets. With a lower centre of gravity, drastically improved torsional rigidity, advanced structural reinforcement and bonding processes, and the extensive use of high-tensile steel, the new Prius boasts the model’s most mass-optimized, best handling, and safest structure yet. Updates and enhancements abound in the latest Prius, including the model’s first-ever use of rear double wishbone suspension to enhance handling and responsiveness, the latest collection of Toyota’s advanced safety systems, and a look that will make the new Prius one of the most distinctive and instantly recognizable models on the road. On board, unique styling cues are flaunted, and the cabin is executed to have a high visual impact, complete with plenty of depth, advanced displays, and unique use of depth and accenting throughout. But it’s arguably under the Prius’ new skin, and beneath its new cabin, where the latest in Toyota hybrid technology reside. This time around, all hybrid system components are smaller and lighter, saving fuel, enhancing performance and optimizing handling simultaneously. A newly-designed gasoline engine achieves a whopping 40 percent thermal efficiency, which is the highest level in any mass-produced engine. Higher thermal efficiency means more of the energy in every molecule of fuel is turned into propulsion within the engine. An all-out assault on friction within the engine helps reduce fuel consumption even further. The Prius’ transaxle and drive motor assembly have been condensed, lightened and made smaller, despite an increase in power output. The reduced size enables this driveline component to be mounted optimally with the Power Control Unit, directly over the front wheels, helping enhance handling and responsiveness. More of the new Prius’ powering-up and sizing-down ideology exists in regard to its battery system, which now fits under the rear seats, freeing up some 56 litres of trunk space in the process. Engineers even delved further into Prius’ management of air-flow and heater efficiency, with two additional systems. On the air-flow front, special shutters in front of the radiator actively open and close in response to vehicle speed, ambient temperature and climate control settings, constantly balancing the demand for cabin heat against current aerodynamic conditions. A lighter and more effective exhaust heat recirculation system actively transfers heat from the Prius’ exhaust stream to the engine’s coolant, further reducing compromises associated with operating a hybrid in cold climates. When it’s hot out, the Prius’ new S-flow air conditioner system focuses cool air only at seats where occupants are detected, saving energy and fuel. It’s this sort of win-win design logic, inspired by years of hybrid car building expertise, that new Prius shoppers can expect to experience powerfully on a test drive. Contact us for more information. Find out more about the All New 2016 Toyota Prius.